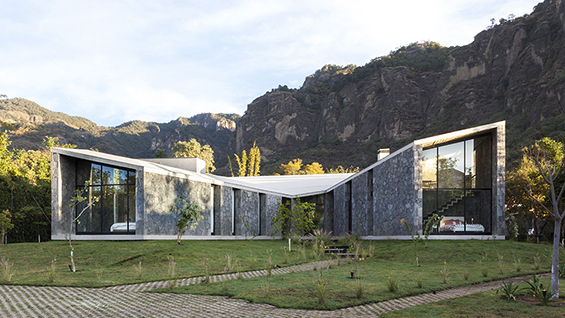 Casa MA, Cadaval & Solá-Morales, Tepoztlán, Mexico. Image courtesy of Sandra Pereznieto. Cadaval & Sola-Morales was founded in New York City in 2003 and moved to both Barcelona & Mexico City in 2005. The studio operates as a laboratory in which research and development are key elements of the design process. The objective of the firm is to create intelligent design solutions at many different scales, from large projects to small buildings, from objects to city fractions. The studio has won numerous awards including the Bauwelt Prize (Munich), the Young Architects Prize form the Catalan Institute of Architects (Barcelona), the Design Vanguard Award (New York), a Mention of Honor for Young Architects from the IX Spanish Architecture Biennale (Madrid), The Silver Medal of the XI Mexican Architecture Biennale in two different occasions (Mexico City), the Prize of the Ibero American Architecture Biennale (Cadiz), the International FAD Prize 2016 (Barcelona), the Spotlight Prize 2016 (Houston) and the Emerging Voices Award (2017) from the Architectural League of New York. Cadaval & Sola-Morales were considered by Wallpaper Magazine as one of the world’s 10 best young offices and by Architectural Record as one of the top ten architectural firms at international level in their Design Vanguard issue. This event is open to current Cooper Union students, faculty, and staff. Members of the public may RSVP by specifying the event title. Room 315F.